In this Monday, Jan. 7, 2019, file photo, Gov. Andrew Cuomo speaks during an appearance with former Secretary of State Hillary Clinton where both Democrats called for codifying abortion rights into New York State law during a joint appearance at Barnard College in New York. Pro-lifers are making a mistake by touting the new abortion law in New York state as anything drastically new. 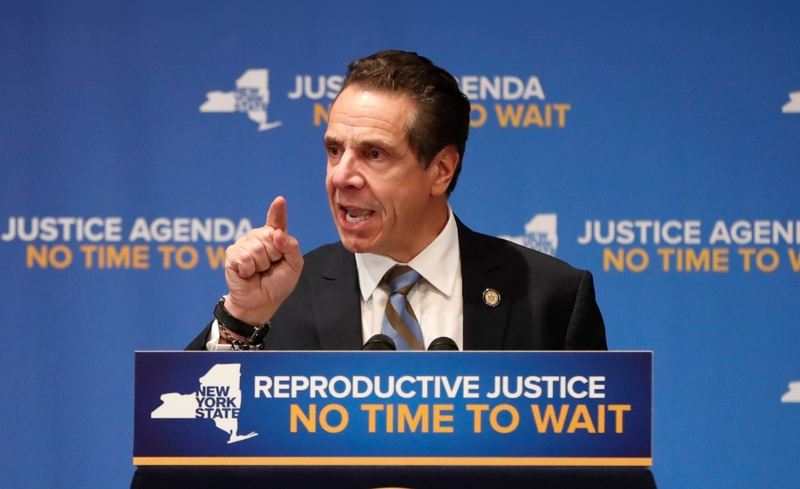 You have seen the headlines, the gifs and memes, the Facebook and Twitter posts outraged that abortions are now legal in New York state up to the moment of birth. Make no mistake the new law is an outrage. But make no mistake, this is not even remotely new. Roe v. Wade itself legalized abortion through all nine months of pregnancy. State laws that appear to ban late-term abortions are not worth the paper they’re printed on. Most Americans have no idea how radical our national abortion law is. Why would they? A day after the Roe ruling, the headline in the New York Times read: “High Court Rules Abortions Legal the First 3 Months.” The original Fake News. In 1973, the Supreme Court took the issue of abortion policy out of the hands of the people and our elected state representatives and wrote a new national abortion policy permitting abortion at any point in pregnancy, for virtually any reason. That’s why pro-lifers speak of “abortion on demand.” And why abortion apologists like Amy Richards trumpet the fact that they didn’t have to have a good reason to abort their babies — they could, just because they wanted to. Many people have heard of Roe v. Wade, but most people have never heard of Doe v. Bolton, decided the same day. If you don’t know Doe, you don’t know Roe. Because of Roe and Doe, an abortionist in America is free to abort a baby at any point in pregnancy so long as he asserts that there will be an “emotional” benefit to the mother. That was the controlling law in New York before this week. What’s New About the New York Law? But it is not remotely “new” that babies can be aborted through all nine months of pregnancy in New York State. That is not new at all. That has been the law in New York State since Roe and Doe mandated it 46 years ago. Most people think an unlimited right to abortion is wrong. That means most people disagree with Roe. They just don’t know it. So why would New York democrats go through the effort to change a law that could never really be enforced anyway? Perhaps it was to rile up their base, to give them what they think is a win. After all the abortion cause seems to have been on a losing streak for a good long while. Waiting periods and informed consent laws have been cropping up in the states, and public support has been on a long slow downward trend. It’s likely they are also preparing for that day when the Supreme Court corrects its abortion jurisprudence and returns this vexing question to the people. Abortion advocates in New York want to be prepared so that they do not miss even one killing day. The mistake pro-lifers are making in their understandable eagerness to paint this new law as radical, which it is, is that they are unwittingly contributing to the confusion Americans have about abortion, and specifically about Roe. There are no significant legal barriers to abortion in the United States today. Yet most people think an unlimited right to abortion is wrong. That means most people disagree with Roe. They just don’t know it. The good news is polling shows, and has shown for years, that most Americans believe in common sense restrictions on abortion, including nearly absolute gestational limits. Even those who self-identify as pro-choice believe in such restrictions. We are not divided down the middle as a nation. That’s an illusion, based on confusion about the law that the other side propagates. Pro-lifers need to help people understand what Roe did to us — we have been disenfranchised on the most important human rights issue of our day. Until Roe v. Wade is corrected, abortion laws will not reflect abortion beliefs in America. The New York law is really bad. Just like Roe.